Liverpool face Watford in the Premier League opening weekend and bookmaker Ladbrokes are offering the best enhanced odds on the clash! Claim 25/1 for Liverpool to beat Watford, plus money back if you lose! Liverpool have won three consecutive matches against Watford, including the two games played last year - 6:1 at Anfield and 0:1 at Vicarage Road. Jurgen Klopp's men were impressive in pre-season, especially at the Audi Cup where they destroyed Bayern Munich 0-3 at Allianz Arena! Are you backing Liverpool to win? Don't miss this offer! Get a terrific 25/1 Liverpool to beat the Hornets! Join Ladbrokes via our special links and claim 25/1 for Liverpool to beat Watford! 3) Place a single bet of up to €/£1 on Liverpool to beat Watford in the 'Match Winner' market before the kick off. 4) If your bet wins, your account will be credited with extra winning to make payout equivalent to enhanced odds within 24 hours. 2. Bets placed in accordance with the terms and conditions will be eligible for the enhanced odds of 25/1 for Liverpool to beat Watford. Maximum one qualifying bet per customer. 4. This offer is available from 08:00 on Monday 24th July 2017 until 13:35 on Tuesday 25th July 2017. 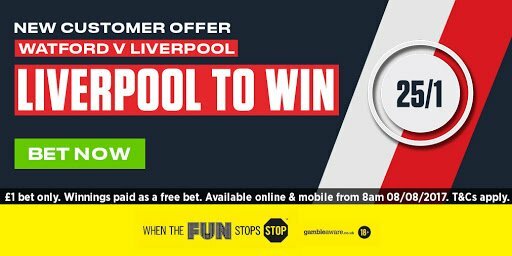 "Join Ladbrokes and get 25/1 Liverpool to beat Watford (Premier League opening weekend price boost)"